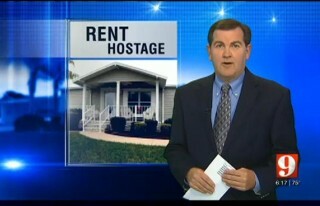 ORLANDO -- Action 9 investigates how thousands of Florida homeowners can become rent hostages. They bought manufactured homes in parks where they rent the lot and then discovered how fast rent and taxes can soar and felt powerless to challenge it. Action 9's Todd Ulrich found families walking away from their own homes. Steps to nowhere and a huge sand pit is all that's left after the manufactured home was moved out of. Don Christmas said he felt driven out of Windmill Village near Disney. Tony Mallozzi just walked away from the home he owned because he can't pay the rent. "Did you have a choice?” asked Ulrich. “No. I couldn't do it anymore,” said Mallozzi. Action 9 found at least eight families in just the Windmill Village community who claim Florida statutes allow park owners to legally keep raising the rent with limited oversight. “I blame myself for being stupid enough to fall for this,” said homeowner Frank Pagani. Pagani showed Action 9 the park's sales presentation. It stated no property taxes and stable rent. The actual contract showed rent could increase up to 5 percent a year but when he questioned the salesman, "He said no, it would not be 5 percent. Generally, it's 2 to 3 percent," said Pagani. Pagani signed the agreement but said the rent increased 5 percent every time, plus he had to pay property taxes, a share of any tax increase the park pays. You can move a manufactured home to stop runaway rent but that can cost $25,000 to $40,000. Selling can be impossible since many owners paid twice what their homes are worth now. HOA expert Barbara Stage said Florida law greatly restricts any homeowners association in these parks and to challenge anything, you have to go to court. “It's like talking to a wall,” said Straight. Mallozzi, who had formed an HOA, said he lost tens of thousands of dollars. “You're a hostage because you have no control," he said. Action 9 reached out to the park's owner several times and it had two owners contact us. 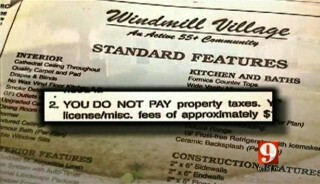 They said the rent and taxes had been fully disclosed when they bought, and many Windmill Village owners are pleased with management.